Local, fresh, sustainable cooking have been the buzzwords in New York’s restaurant scene and around the country lately, but Chef Richard Farnabe, the newly appointed Executive Chef for GrandLife hotels (SoHo and Tribeca Grand), has taken this concept to a whole new level. Farnabe is bringing farm-fresh closer than ever by growing a garden in his own backyard—on the rooftop of the 17-story SoHo Grand. Classically trained in France at Ecole Hoteliere Beliard Paris under Jacques Maximin, Chef Farnabe launched his culinary career at Le Theatre in Nice and then at Le Diamont Rose on the Cote d’Azur. Soon after, he followed his dream and moved to New York City working his way up from Sous Chef at Daniel and then Jean Georges, into notable positions as Chef de Cuisine at Soho’s Mercer Kitchen, Personal Chef for Tommy Hilfiger, and then moving on to several Executive Chef positions at Montrachet, Picholine and Cavo. He is now the Executive Chef at both Soho Grand and Tribeca Grand, tweaking the original menus with fresh, artistic creations of New American cuisine with French influences. Chef Farnabe has been gardening for quite a long time, but he only recently combined gardening and cooking to produce the fresh, sustainable cooking at the GrandLife hotels. 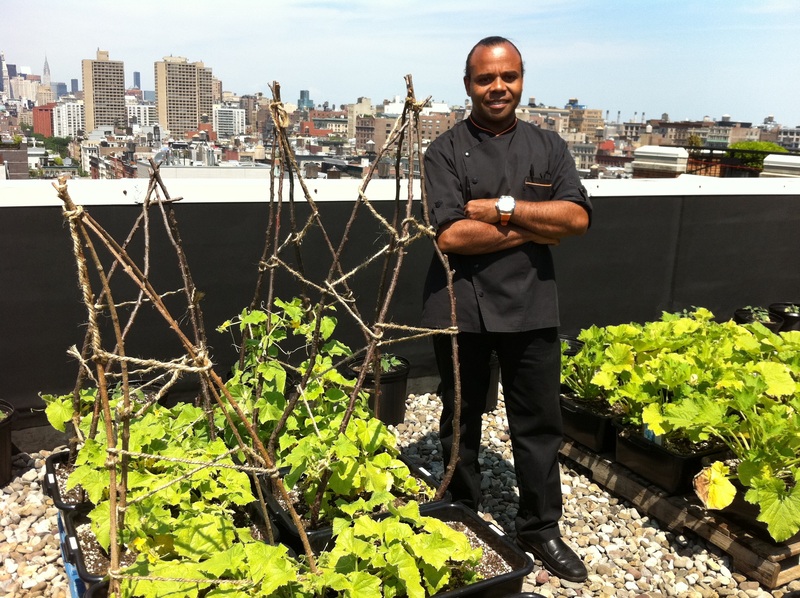 He decided to start the rooftop garden because the hotel had been cooking with a lot of micro-greens in the kitchen, and by growing their own herbs and vegetables, the kitchen could both cut costs and keep the ingredients fresh, local and sustainable. The 3-month old garden covers the entire rooftop of the hotel, which has an amazing view of the New York skyline. In the garden and a connected greenhouse, there is a wide variety of tomatoes (16 cultivars of heirlooms) and vegetables like avocado, carrots, onions, French beans, jalapenos, habeneros, bok choy, broccoli, cucumber, asparagus, butternut squash, pumpkin, red beets, eggplant, mesclun, arugula, romaine, zucchini flower and peppers. There is also a variety of fresh grown herbs such as mint, basil, sage, chive, cilantro and parsley. The hotel’s outdoor patio bar and restaurant, The Yard, is a casual relaxing place in a sandstone courtyard. Here, imbibers will find signature cocktails created with fresh herbs and veggies such as the Strawberry Smash made with Bulldog gin, fresh basil, sugar and fresh strawberries or the Spa, made with Hendrick’s gin, fresh cucumber puree, fresh lime and fresh mint. 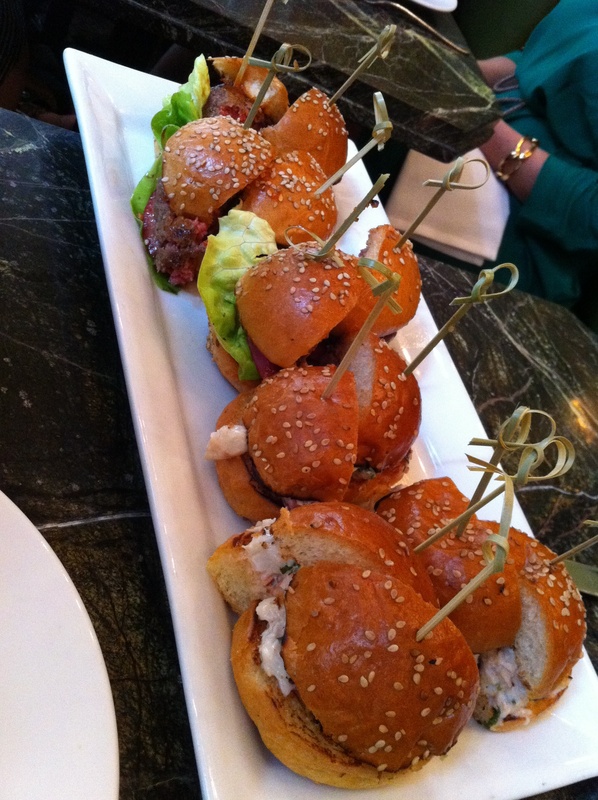 One can also enjoy fresh summer fare including appetizers and salads, seafood from the raw bar, BBQ shrimp, ribs and pork, as well as a variety of grilled sliders and lobster rolls. 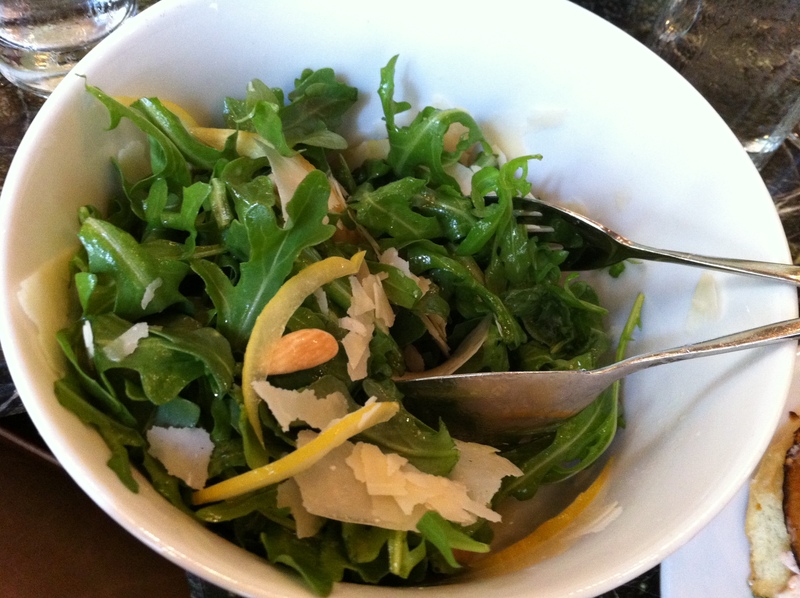 I sampled some of Chef Farnabe’s dishes that were made with fresh garden produce. An arugula salad with toasted almonds, preserved lemon and shaved parmesan, tuna tartare with avocado and potato gaufrette, and a gorgeous zucchini flower, lightly tempura battered, stuffed with goat cheese and freshly cut herbs from the garden – the epitome of fresh, local, sustainable food, all right here from a rooftop garden in New York City. Meet Chef Adam Shepard from Lunetta with an in-depth, up close interview as Kristen Hess and eDiningNews interview Adam about his background, Lunetta’s Mediterranean gourmet fare, insights on his cooking style, and his commitment to the Slow Food philosophy. 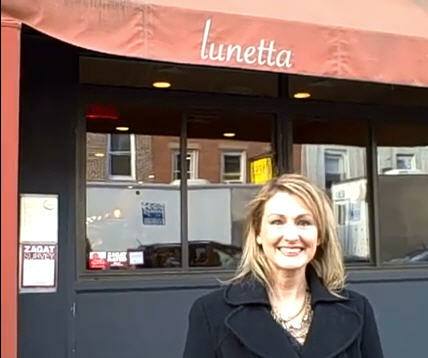 Lunetta, a trendy Mediterranean restaurant on Smith Street in Brooklyn, has a fantastic menu and atmosphere that you must try for yourself! They offer a variety of small plates and gourmet market fare such as bruschetta, antipasti plates, fresh roasted market vegetables and a variety of pasta dishes and entrees including Pappardelle with Porcini-braised Berkshire Pork, luscious Lunetta meatballs, and savory Sullivan County chicken, roasted under a brick with mushrooms and marsala wine. Lunetta has been featured in “The New Brooklyn Cookbook” and is a practicing member of the Slow Food International group who’s philosophy it is to commit to food biodiversity and use all local and organic farmers, growers and food suppliers. In warmer temperatures, you can dine alfresco in the back garden, or enjoy a private dinner party in their cozy yet spacious dining room with a full bar.